UPDATE: The Associated Press is reporting that Congo's national electoral commission has announced a 48-hour delay in publishing final presidential election results, due to technical difficulties. NAIROBI, Kenya — With the announcement of Congo’s next president expected before midnight tonight, though possibly delayed, the restive eastern part of the country is quiet but wary about what tomorrow might bring. 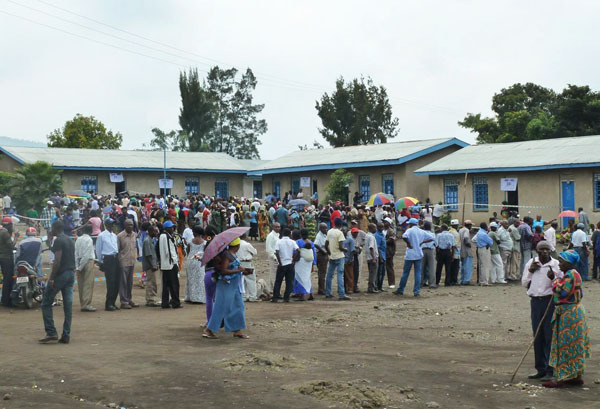 Early vote tallies predicted President Joseph Kabila as the winner, with UDPS candidate Etienne Tshisekedi as a close second, but the electoral commission today announced that with more than two-thirds of the ballots counted, Kabila had pulled ahead with 46 percent of the vote, to Tshisekedi’s 36 percent. Despite widespread allegations of rigging and logistical constraints that denied many eligible citizens the right to vote, international observation missions have blessed the process. The stage seems set for Kabila to be declared winner of another five-year term. According to the preliminary count by the national electoral commission, tallied by province, Kabila is leading in both North and South Kivu but doesn’t carry a majority in either province. But unlike in other parts of the country, a Kabila victory will likely cause greater calm in the East than any other electoral outcome. The region has had a unique connection to President Kabila because it was a rebellion led by his father and originating in the East, with support from Rwanda, which overthrew long-time dictator Mobutu Sese Seko and installed Laurent Kabila as president in 1997. Joseph Kabila was born in South Kivu province and rose to the presidency after the assassination of his father in 2001. Joseph Kabila is credited with officially ending the war in the East in 2003 and with striking an unexpected compromise with friend-turned-foe Rwanda in 2008 that saw the formal integration of the formidable CNDP rebel group into the Congolese national army. But many of the voters the Enough Project has spoken to in the eastern cities of Goma and Bukavu say that the enduring insecurity in the East, the lack of infrastructure and social services, and the rampant corruption and impunity undercut any advantage Kabila might have enjoyed as a “native son” of the Kivus. Justice and republican army are the pillars of any strong countries. Joseph Kabila has proven to be not even the least good on those subjects. With our mineral wealth and other natural resources, Congo has all the cards to be a country that can contribute positively to the world advancement. (…) But since Kabila controls the country assets, the army, police and secret service, I'm afraid my choice would not make a big difference. Some parts of the country, in particular the capital of Kinshasa, are bracing for a likely showdown in the event that Kabila is declared the winner and opposition leaders dispute the final results. News reports indicated that thousands of Kinshasa residents had poured over the border into neighboring Republic of Congo in anticipation of violence in the capital. Armed groups, most worryingly the ex-CNDP rebel group and segments of the Congolese army, have pledged to fight back if Kabila is not declared the winner. Military units and members of the ex-CNDP have been involved in coercive attempts to compel voters to support Kabila. Kabila win may thwart the likely renewed insurrection instigated by the armed groups who have benefited during his time in power—an outcome no doubt quietly welcomed by institutions like the U.N. peacekeeping mission that already have a difficult time responding to frequent attacks against civilians in the East, at times perpetrated by Congo’s own army. Threats issued by groups like the CNDP, combined with the view expressed by some civilians that the region feels more peaceful now than it has in more than a decade, have contributed to the sense of resignation about the prospect of another term of President Kabila. Certainly not all opposition leaders and supporters will accept the results without protest, possibly leading to clashes, but even those who say they voted for the opposition voiced concern about the impact in the East if their candidate won. Fidel Bafilemba and Sarah Zingg Wimmer contributed to this post from Goma, and Amani Matabaro contributed from Bukavu.